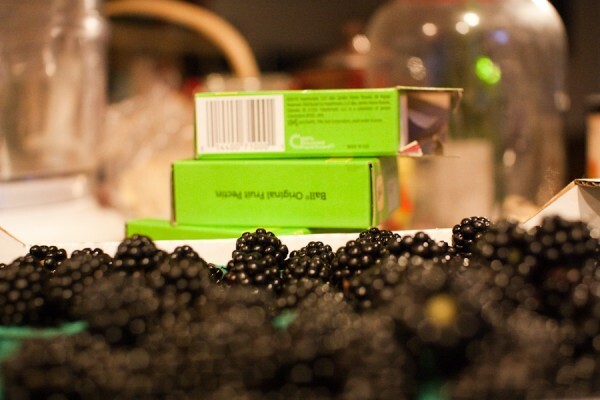 It all started when I thought it would be a good idea to buy a flat of blackberries. They were a deal, and I was able to bargain (!) to get a lower price. So then we were stuck with all.these.blackberries. Right. 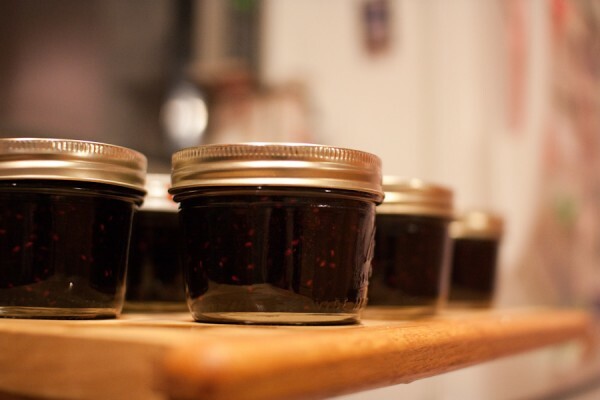 Not to be discouraged, I exclaimed “Let’s make jam!” Tom and I have made jam before, and it’s usually a sticky, messy good time. 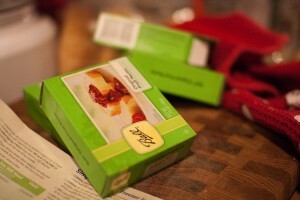 However, in the past, we have never had the quantities of berries that we were faced with this time. This was going to require two batches of jam making to happen at the same time. 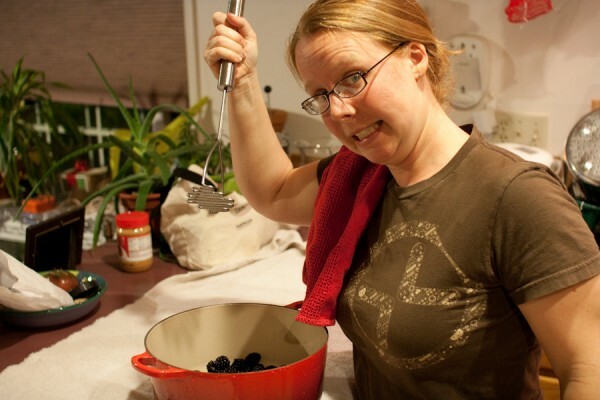 Now, this wouldn’t be a problem on a normal 4 burner stove, because you would have one burner for each pot of berry mixture, and one burner for steralizing your equipment and one burner for processing the jars. Here’s the rub: we only have two burners. Oh, and this weird induction plug in thing that kinda acts as the third burner. But no fourth. Hm. 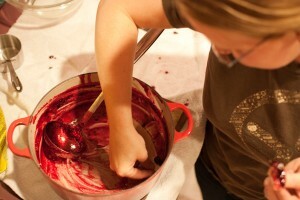 We started out by cleaning all the berries and crushing them, four cups at a time in one of our larger pots. 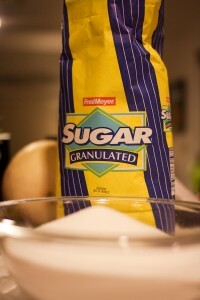 We added kind of a lot of sugar, but it’s tastier that way. 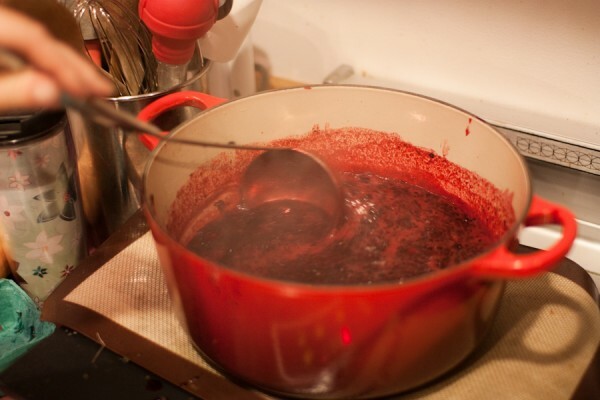 Then we boiled the mixture, finally adding pectin at the end. 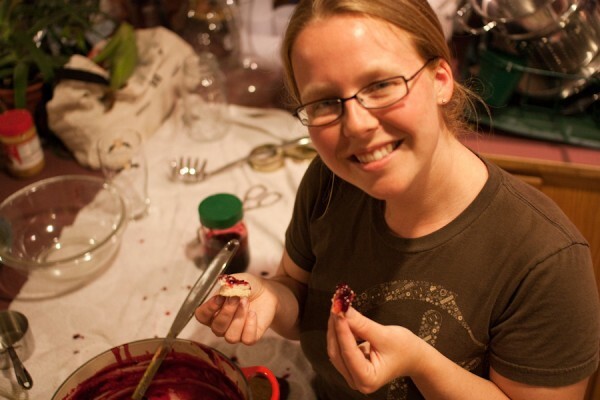 Then we poured this liquid magma like stuff into jars that have been steralized, added the canning lids, and dropped them into a boiling water bath for processing. 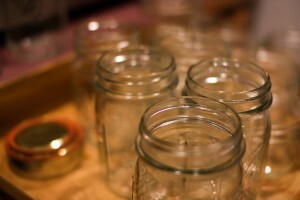 The jars came out sealed like magic. At least, this was how the first batch went. Nice and smooth. 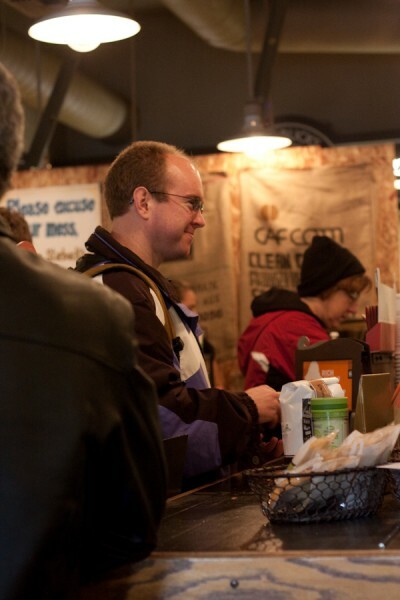 However, we had to start the process all over again with the second batch about midway through the first batch. About the time that the boiling mess of blackberrysugar needs pectin and pouring, the other blackberrysugar mess needed to go on the stove. There were not enough burners, and very few places to put things because once the jars and utensils are sterilized, we try to interact with them as little as possible. 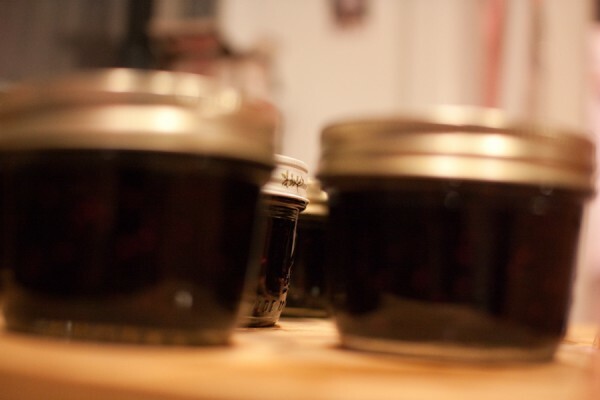 It was a three ring circus of blackberry jam. We did get both batches finished and canned though, with only one jar that didn’t seal correctly, but that’s not too bad, because we’ll just use it! 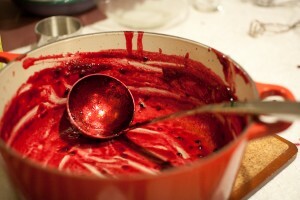 Oh, and for “clean up” we may have wiped the left over jam out of the pot. It might have been amazing. I like how cute the jars look all lined up. If you’re good, you might end up getting of of these for Christmas! Last weekend, Tom and I flew to Maryland for the funeral of one of his oldest friends, John Merrill. As is often the case, the details are sad. John was killed in a landslide while hiking in Colorado with his dog Oof. His dog refused to leave John’s body when other hikers arrived on the scene of the accident, and ended up staying all night on the mountain with his beloved companion until the SAR folks were able to recover John’s body. Oof has since been adopted by one of the SAR workers. His wife was pregnant. These are the details. The facts reported over and over in the papers. Somehow they seem so empty. They say nothing about the intelligent, kind, complicated man that John was. That there was so much more to his life than the way that he died. 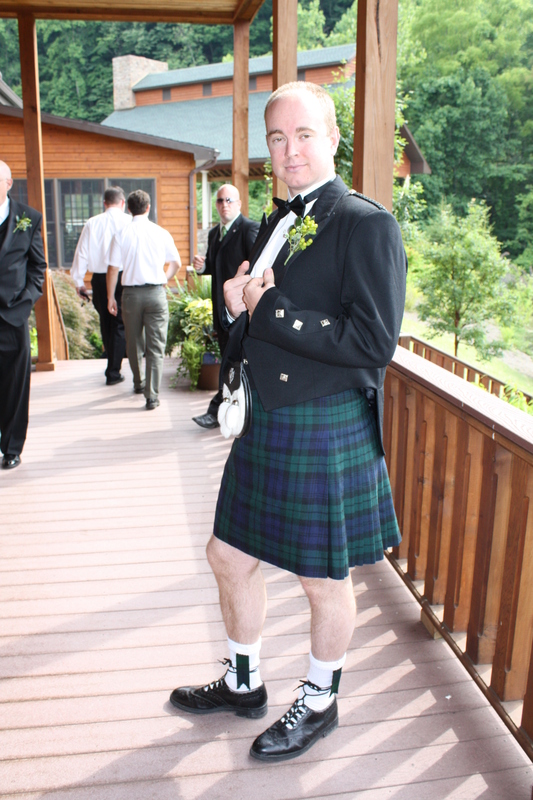 I only knew John for a short time, but I will remember him as a funny, quirky guy who danced in his kilt at our wedding. I will remember how much he loved show tunes. I will remember how much he loved America, Guatemala, animals and wild places. I will remember what a good friend he was to my husband. In the past three years I have lost two friends to the mountains. People who do not hike or climb always ask, “Why were they there? Why were they climbing? Why were they hiking?” And the simple truth, for me, and I believe for those who I have lost, is that we climb, and we hike, because we must. It is a necessity of our lives. To be out in the wild is where I find my peace. It is where I find myself. As John’s mother said at his memorial, quoting her son, “I climb the mountains to get closer to God”. We will miss you John, but we will always remember you in the high, wild and beautiful places in the world.